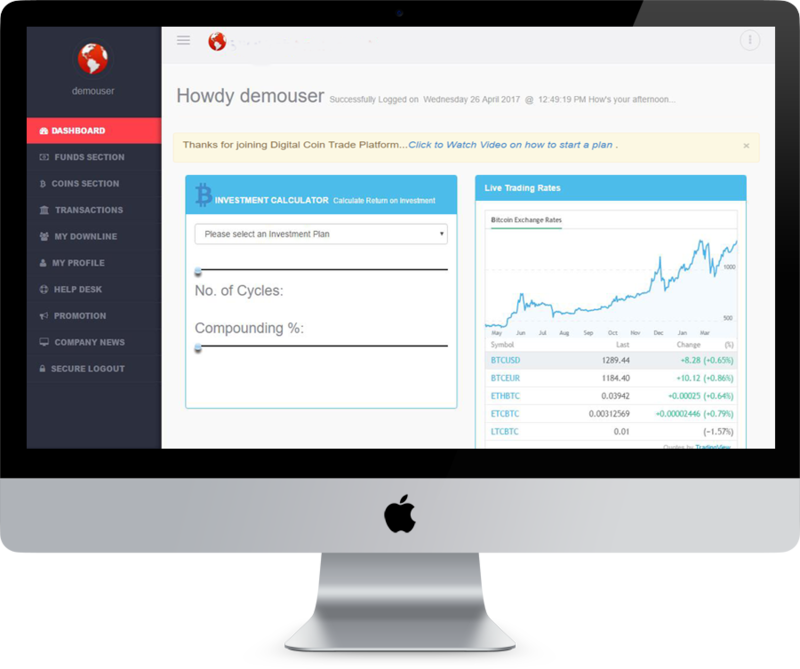 Digital Coin Trade:Investment Program:Bitcoin Investment Program. 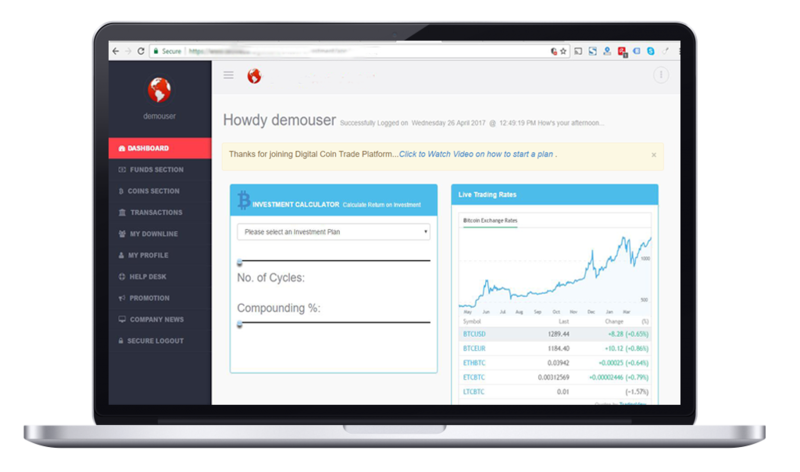 Digital Coin Trade®™ Investment Program is based on floating rate, arbitrary trade, swap trade and currency swap between Bitcoin and Dollar versus other cryptocurrency prices and rates. All transactions and trading are executed via back office to secure both your investment and interest. Investment are done via our in-app DCT®™ token. Investment have a 2 cycle (60 working days) duration. Earn 30% per cycle and capital after 2 cycle. Earn more by Compound interest up to 100%. Cash out in BTC, ETH, BCH, XRP, LTC, and FAIT. One time 5% Bounty Referral Commissions. Trading of digital assets futures value, trading on diversified digital assets portfolios as part of risk management, leveraging using swap trade and swap currency investment tools to provide Fixed rate interest against Floating rate of investors cryptocurrencies. Initiating a 15% Fall on Fixed rate interest (Risk management) during a bearish market volatility of -15% continous crypto market dips. Earn 1% for 30 working Days 1 cycle (2 cycle min duration with capital back). How To Start Crypto Currency Investment. Open an account, login to the dashboard, visit the FUND SECTION, click on the deposit tab, input the amount you want to deposit, select your preferred payment option and process your order. Your processed order should reflect on your CASH BALANCE WALLET, next click on the dashboard go to the investment calculator, select the plan that tally's with your cash balance, if none, please make more deposit. Make sure you have the right amount in your cash balance wallet for the investment plan of your choice and proceed with selecting the duration (by default we have 2 cycles) and also selecting compounding percentage (if you want to reinvest your interest). Please note you can select a compounding percentage from 20% to 80% anything below 20% will be auto selected as 20% any compounding greater than 80% will become 100%, and the remaining percentage will be cycled out to cash balance for every 1 cycle (30 working days) is completed within the duration selected for the investment. If everything looks good, you are set to launch the investment portfolio. Simply click on the launch button to cross check your digital investment on the checkout page prior processing the crypto investment, which will be deducted from your cash balance wallet. All set and done, you need to wait 30 working days for 1 cycle to complete to cash out your 1st 30% if investment is not compounded by 100%, after that another 30 working days to complete the 2 cycle minimum duration to get both 30% and capital back. Leverage on Volatility. Arbitrage Pricing. Floating Rate. Swap Trade. minimum Investment Open Your Account! We plan to release a mobile application for our digital asset management platform. Coming Soon on Mobile: Digital Coin Trade®™ All in One Digital Assets Management Platform.